WOODTECH is an American furniture manufacturer based in Oakland CA; WOODTECH is minority-owned, USA made products, and in business since 1994. The 100,000 SF plant is 100% solar power driven; all new wood is FSC certified, and we can make anything. 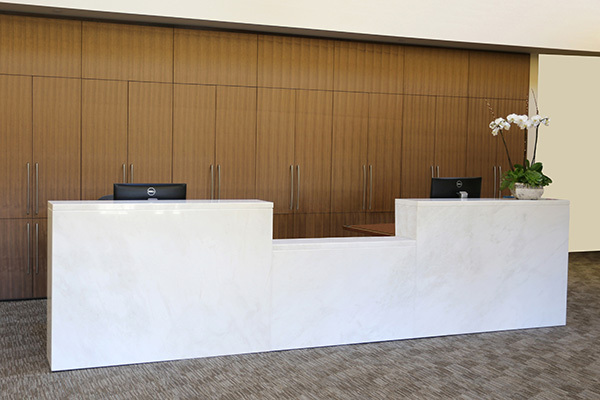 Our specialties include tables, desks, reception units, wall panels and other ancillary items. Lead-times are 7 weeks after drawing approval. Click the logo below to learn more about Woodtech. MOVIS is a collection of acoustic solutions to address sound. Products include sculptural shapes (circles, leaves, squares) that are mounted to walls or ceilings. 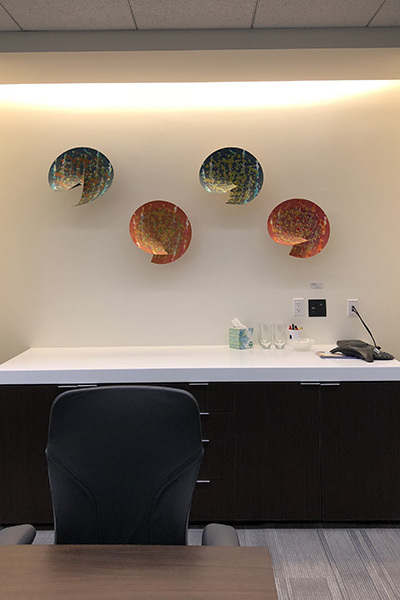 Full size templates indicate placement of brackets (in varying lengths and with varying angles) that allow a floating effect of these sculptural, sound-absorbing shapes. Functional art! Complete with a .50 NRC (noise reduction coefficient). The newest introductions are light pictures and LED fixtures. Allow eight weeks for products to arrive from Europe. Click the logo below to learn more about Movis Design.